Friday the 13th, and a miserable drizzly day, but that didn’t stop us digging for “something nasty in the woodshed“! Looking SE at concrete gully outside kitchen/washhouse window. The first target of the day was the beautifully preserved concrete gully which fed into the salt glazed stoneware ‘gully drain’. 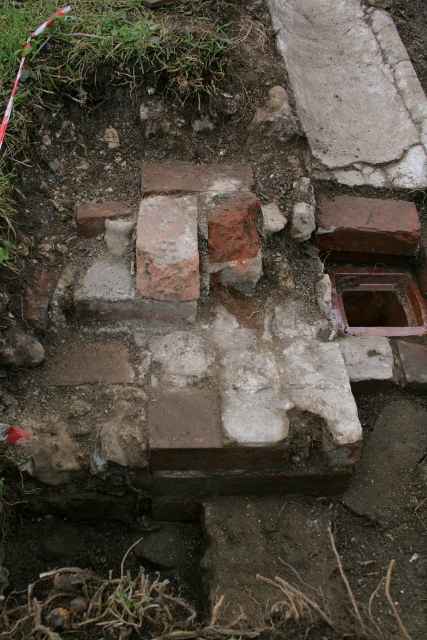 Situated directly outside the kitchen/washhouse window, the most likely location for the kitchen sink, this suggests it is likely to have been used as a drain for ‘grey-water’ rather than to collect rainwater for a water-tank or well. 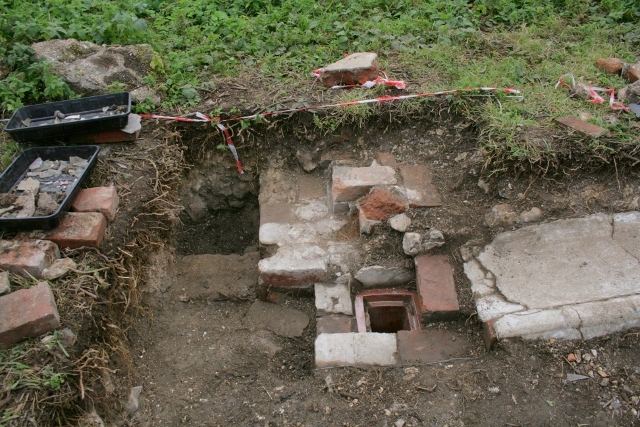 Looking W from ‘woodstore’ doorway at ceramic drain and concrete gully outside kitchen/washhouse. Looking S from near front garden gate at ‘woodstore’ doorway, ceramic drain and concrete gully outside kitchen/washhouse. View SW of NW corner of ‘woodshed’. Next, a new grid square was opened to the east of the drain, over the entrance to what we have been told was a woodstore, at the east end of the gable frontage of the cottage. 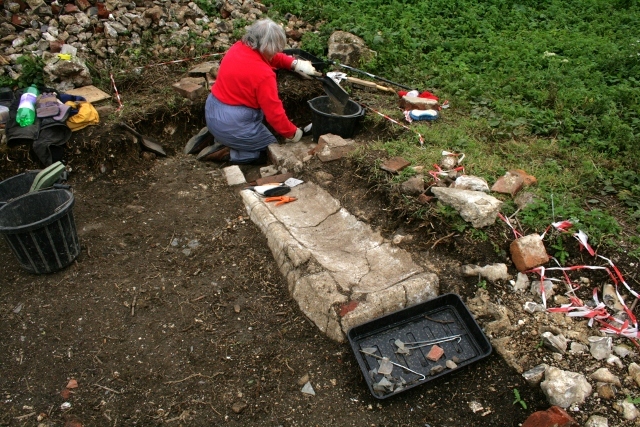 We were very surprised to discover the threshold for the doorway, and the earth floor beyond, was about half a metre below the floor level of the kitchen next-door. Cottage and shed frontage showing approximate level of ground. The front of the cottage was built on a slope, and the floor inside the cottage, at its east end, was much higher than that of the ground surface outside. 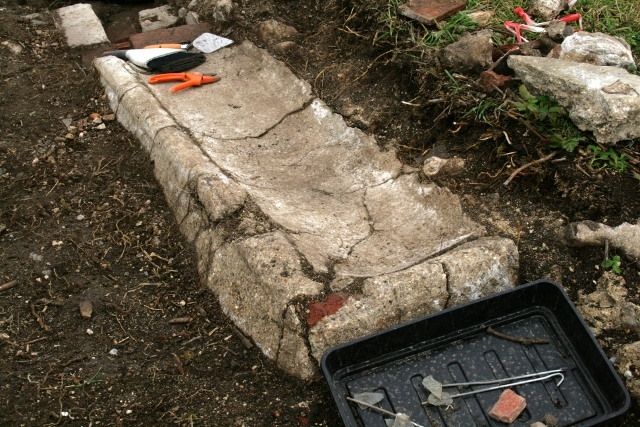 It can now clearly be seen that the bulldozer, following the slope of this outside ground surface, cut away most of the floors inside the cottage. However, because the bulldozer cut was merely to tidy up the site after its WW2 ordnance demolition, everything at a lower level (except the areas which took a direct hit from military ordnance) has survived under a layer of demolition rubble, including our woodshed. 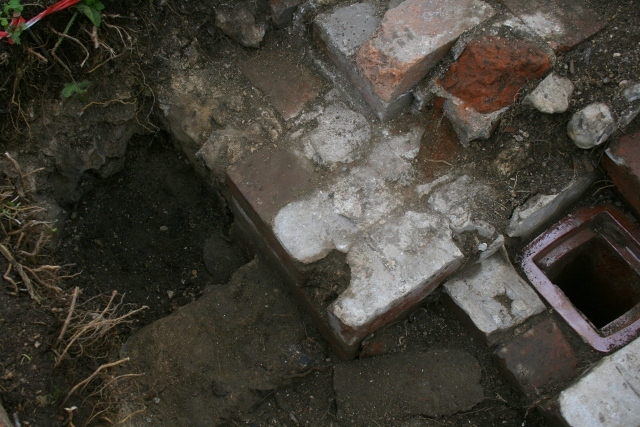 Having further cleaned up the adjoining north end of the east wall of the kitchen, we now know it was of the same thickness as the other external walls of the house. This strongly indicates it was a load bearing wall. It was also inline with the gully drain, suggesting it received the outfall from a rainwater gutter downpipe. These two observations strongly indicate that the woodshed was not an integral part of the main body of the house. Therefore the two bedrooms in the roof – across the width of the front gable of the cottage – only extended over the kitchen/washhouse, and not over the woodshed as well. Finds were not particularly numerous, but made up for it in quality. Painted dolls foot – wearing a shoe. 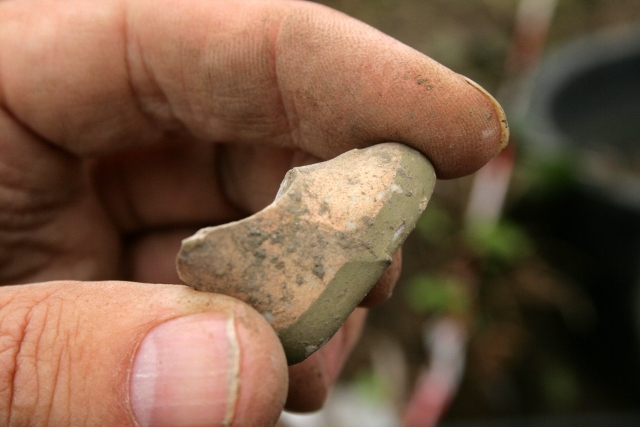 A small painted doll’s foot was the find of the day. The most surprising find was a short length of pencil lead next to a shorter length of extremely thin, partially folded, yellow glossy plastic like material – perhaps paint? 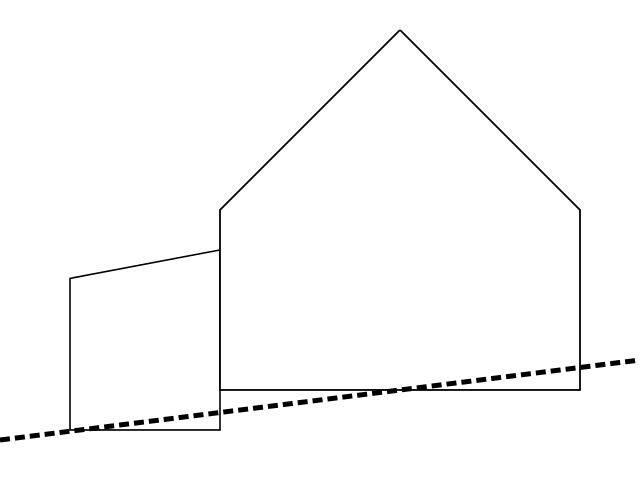 The distance between each of the fold lines was about that of the width of a hexagonal face of a wooden pencil. Was this all that remained of the stub of a pencil, after all the wood had decomposed? Black rubber screw threaded stopper for a Ballard’s beer bottle. 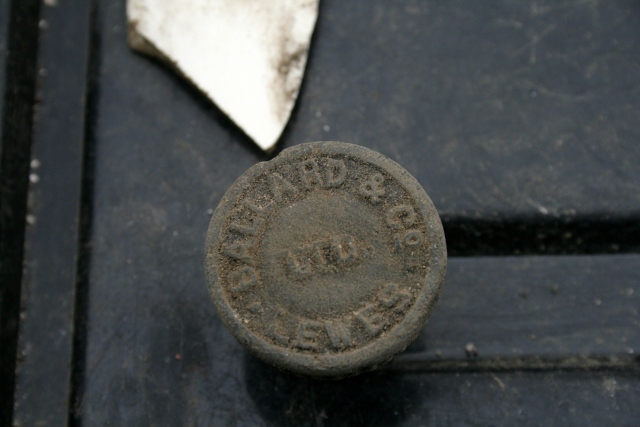 Also nice was a hard black rubber screw-top stopper with the name ‘Ballard & Co. Ltd. Lewes’; this was from a brewery in Southover, Lewes, which apparently was in business from at least 1900 but had stopped production by 1930. 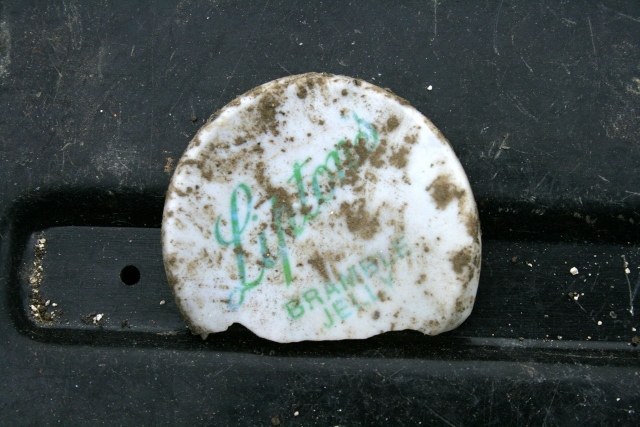 Plastic snap on lid of Lipton’s Bramble Jelly. Whilst the Lipton brand is famous today for its tea, its stores sold many other products including, apparently, bramble jelly. The lid is almost certainly made of a flexible PVC which first became commercially useful from 1926. It is unlikely to be made of polythene because commercial production was only developed by 1939, and all of its wartime production was to diverted to military uses. 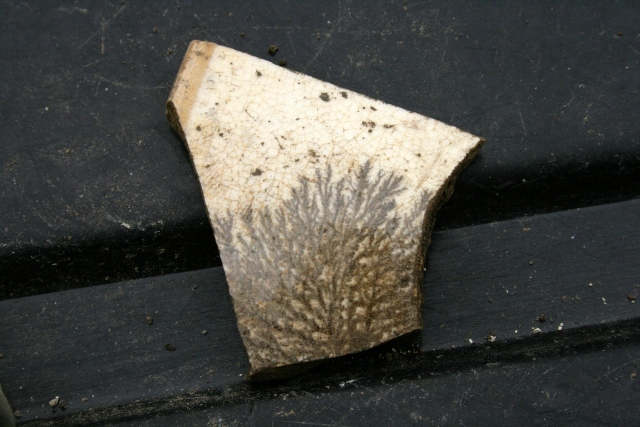 This nice ceramic shard of shows a tree or moss-like ‘dendritic’ plazed patterned glaze and is known as mochaware. It was first developed in the 18th century and is still used as a design today. Next Friday we will continue exploring the woodstore, before moving further down the east side of the house looking for the possibility of a back door, as well as for the fireplace (if it hasn’t been removed by the bulldozer). Round the corner, to the south of the cottage we will be looking for another well. Friday’s weather may or not be wet, but we will be at the car park near the junction of Bexhill Road and Falmer Road, just north of Woodingdean, at 10am, and if the weather is bad will make our final decision whether to dig then. Even if it is too wet to dig we would be happy to give a quick guided tour for anyone interested. Please don’t hesitate to give me a call for further info.